As a 21-year-old sailor during World War II, Frank Panek escaped death when his ship was torpedoed and sank in the South Pacific, with more than 300 of his shipmates killed. He was not so fortunate as an LAPD officer five years later, on a street corner in Los Angeles. On Thursday, April 10, 1947, Officer Panek and his partner, Officer Hugh Brown, were cruising in their patrol car near East 5th Street and Towne Avenue in downtown Los Angeles when they spotted a man walking on the sidewalk with a suspicious bulge in his pocket. Panek and Brown stopped their patrol car next to the man, a 41-year-old cook who lived in the neighborhood. Panek got out of the car to question the man, while Brown remained in the vehicle. As Panek started to search the man, Brown saw the man pull out a revolver. Brown jumped out of the patrol car and shouted at the man to drop the gun. 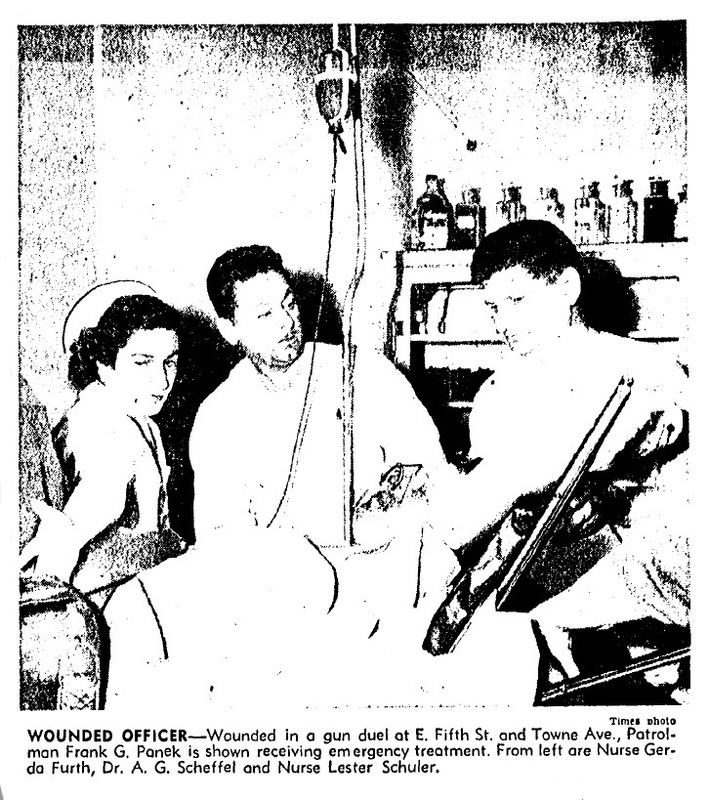 Instead, the man fired one shot at Panek, with the bullet going through the officer's left hand and into his chest. Both Panek and Brown quickly returned fire, hitting the man seven times in the left cheek, chest and abdomen. Both Panek and the gunman were taken to the Georgia Street Receiving Hospital. The gunman died en route. Panek arrived at the hospital in critical condition, and died four days later, on April 14, at the age of 26. Frank George Panek was born Nov. 14, 1920, in Duluth, Minnesota, the youngest of four children of Peter and Elizabeth Brown Panek. His father was born in Germany, immigrated to the United States in 1903, and worked as an engineer. His mother was born in Michigan. In 1927, when Panek was 6 years old, his father died at the age of 38. At the age of 18, on June 13, 1939, Panek enlisted in the U.S. Navy, after serving one year in the U.S. Naval Reserves. The following year, Panek's mother died at the age of 55. In the Navy, Panek was assigned to the USS Vincennes, a New Orleans-class cruiser named after the city of Vincennes, Indiana. 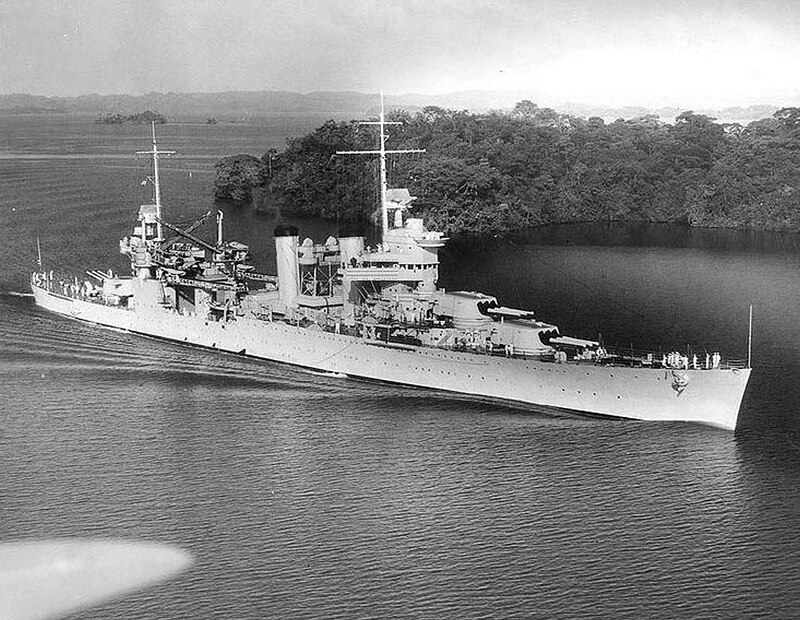 When the United States entered World War II, the Vincennes was sent to the South Pacific. In early August 1942, the Vincennes assisted with the landing of the Marines on Guadalcanal, the first major offensive by the Allied forces against Japan. The Japanese navy responded with a night attack on the Allied support ships, including the Vincennes, the USS Quincy and the USS Astoria, in what became known as the Battle of Savo Island. The Vincennes was able to repel the initial Japanese air attacks on Aug. 7, dodging one torpedo which passed beneath the stern of the ship, while shooting nine Japanese bombers out of the sky. 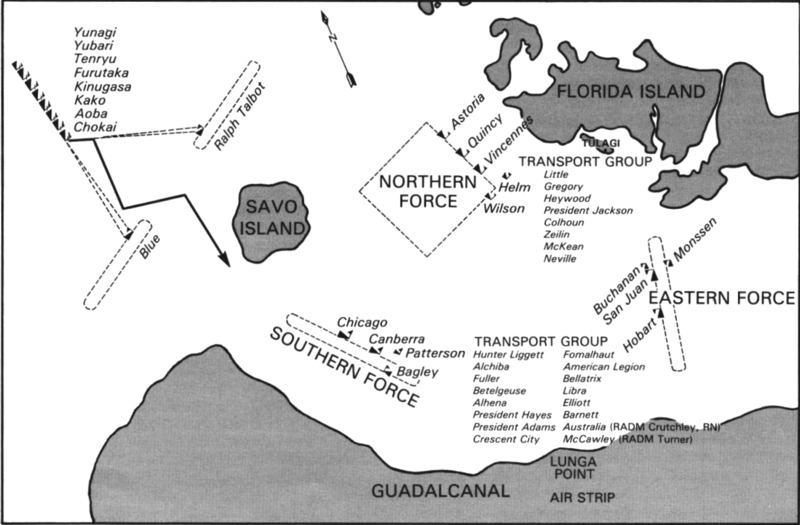 As the Japanese air and naval attacks continued, the Vincennes, Quincy and Astoria headed north to a position off Savo Island, to screen the Allied transports, which were still landing on the beach at Guadalcanal. Just before 2 a.m. on Aug. 9, the Japanese navy launched torpedoes at the three U.S. ships, illuminated them with powerful searchlights, and started firing on them. The Vincennes was hit repeatedly by both torpedoes and gunfire from the sea and the air. Some of the incoming shells set fire to the scout planes in the Vincennes' hangar area, igniting aviation fuel and resulting in an uncontrollable fire. Incoming shells disabled the Vincennes' bridge and radio antenna. Two torpedoes hit the ship and knocked out both engine rooms, leaving the burning Vincennes dead in the water. The bright flames provided an easy target for Japanese aircraft, and their incoming bombardment quickly knocked the ship's anti-aircraft guns out of action. In addition to the torpedo strikes, the Vincennes was hit more than 85 times by 5-inch and 8-inch shells, and the helpless ship gradually began to list to port. Capt. Frederick Riefkohl issued the order to abandon ship at 2:30 a.m., and the crew began to break out the life vests and lower the rafts. The Vincennes rolled over and sank at 2:50 a.m., two miles east of Savo Island. The Quincy and the Astoria, which also took heavy aircraft and torpedo fire, also sank. Of the 952 officers and crewmen aboard the Vincennes, 332 died in the battle and 258 were wounded, while 370 died on the Quincy and 219 died on the Astoria. 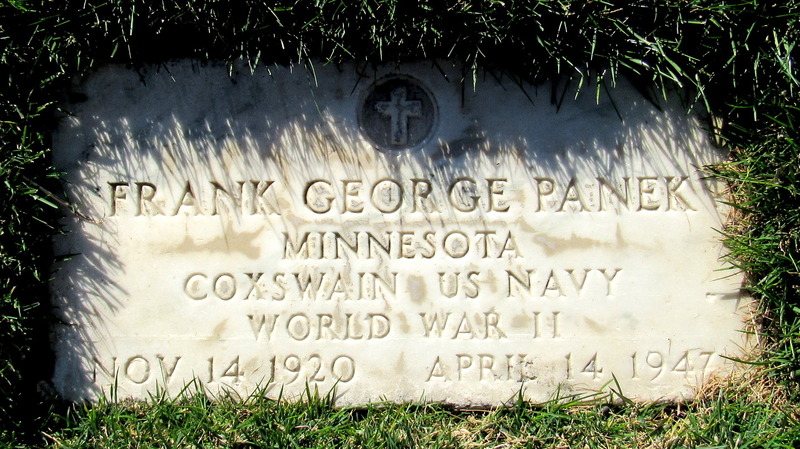 Coxswain Panek was among the wounded, and he spent the next several months aboard the USS Solace, a hospital ship, before he returned to the U.S., and was discharged from the Navy on July 16, 1943. In recognition of his military service, Panek is buried at Los Angeles National Cemetery. Panek's sign is located on the Northwest corner of Towne Avenue and East 5th Street.